Use this vanity to bring more traditional style into your bathroom. Its comes with a nice white marble counter and brown solid wood base for strength and style. Put together your perfect bathroom with this stylish vanity set from Wyndham Collection. Bring a fresh, traditional look into your bathroom with this vanity. The white marble counter and brown solid wood base make a beautiful look in your bathroom. The roomy double-door cabinet is great at storing your bathroom must-haves. 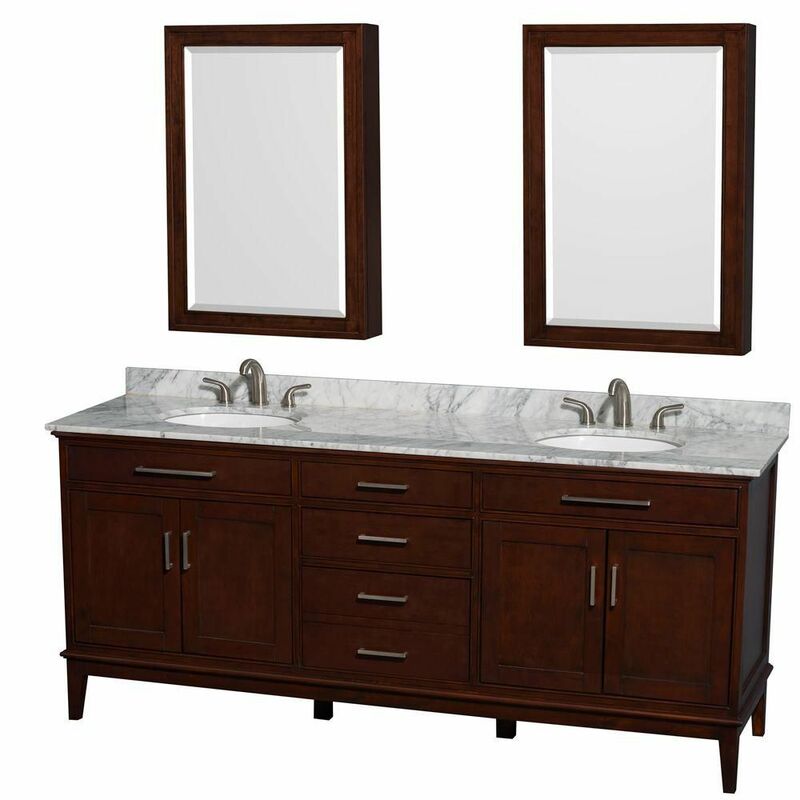 Put a nice touch on your bathroom's look with this vanity set from Wyndham Collection. Enjoy the popular traditional look in your bathroom with this beautiful vanity. The good-looking white marble counter and brown solid wood base make a big difference in your bathroom. The simple double-door cabinet is great to keep bathroom items in. Add a classic feel to your bathroom with this simple vanity set from Wyndham Collection. Hatton 80-inch W 3-Drawer 4-Door Vanity in Brown With Marble Top in White, Double Basins With Mirror Use this vanity to bring more traditional style into your bathroom. Its comes with a nice white marble counter and brown solid wood base for strength and style. Put together your perfect bathroom with this stylish vanity set from Wyndham Collection. Hatton 80-inch W 3-Drawer 4-Door Vanity in Brown With Marble Top in White, Double Basins With Mirror is rated 4.3 out of 5 by 3. Rated 5 out of 5 by Jim from looks great and well-made with solid wood and good quality... looks great and well-made with solid wood and good quality plywood. No particleboard! Rated 4 out of 5 by BW from Beautiful piece. Had to return due to shipping damage. The... Beautiful piece. Had to return due to shipping damage. The process was easy and in the end we had a lovely piece. The damaged one was white with just a little gray veining. The new one has lots of gray. Liked the mostly white one much better. Still quite nice. Rated 4 out of 5 by KLT from Good value, sturdy construction We ordered it without the top/sinks & used a local provider for our 3 cm slab of marble - much more luxurious look for a similar cost. Wood finish is not stellar (rough in some areas), but it's ok. Cabinet is all wood, sturdy & looks great now it's installed. Drawer/door action seems ok. Extra shelves appeared to be missing, but they were taped to the bottom of the unit. It comes with sets of both light and antiqued looking hardware. The lighter set is not a perfect match with my polished nickel fixtures, but it's not terrible either.